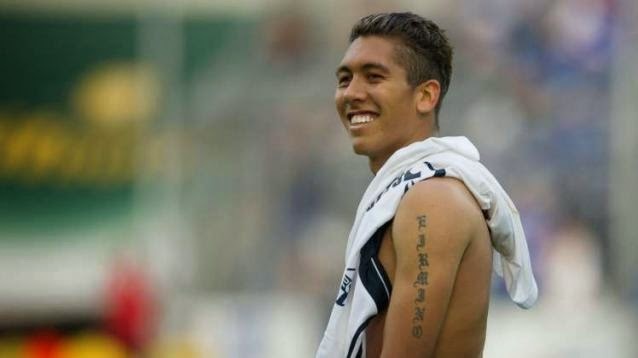 REPORTS: Chelsea to offer £15m for 22 year old "Highest scoring Brazilian"
According to various reports, Jose Mourinho has earmarked Hoffenheim attacker Roberto Firmino as a transfer target and is willing to pay £15m this summer to sign him. I will be honest, I do not follow German football and I know little about him and wondered if any of you reading this post know a little more of him? "The Blues, who are keen to wrap up the majority of their transfer business before the World Cup, have already kick-started their summer by agreeing a £32million deal for Atletico Madrid striker Diego Costa. And with Jose Mourinho wasting little time, Firmino is the next target Chelsea are looking at adding in quick succession. According to reports in Germany, Mourinho has given the green light for a £15million offer to go in for the 22-year-old in the coming days. Firmino, who was the highest scoring Brazilian in Europe this season, missed out on a place at the World Cup but is destined for big things. A fast, creative and technical player, he can play in any attacking position from the wing to up front, and is famed for his excellent dribbling and agility. Liverpool, Bayern Munich and Barcelona are all known to be keen on Firmino, who is said to be a huge fan of Premier League football. " So it seems as though the manager wants at least one more player within the squad that can play in one of those attacking positions. We have Hazard, Oscar, Willian, Schurrle and Mohamed Salah currently and not including the players we have out on loan (such as Moses, Atsu and Piazon) we are short of one more player there making it six. There is no point me talking about him because as I said, I know little of him. So, I have included the video below to have a watch and see. What do you think of him and the possible link to Chelsea?